type....Johnny Crawford who was Mark McCain on the Rifleman with Torchy Smith. it is a rare interview... Baby Boomers Talk Radio….2016..from Spreaker.com. How Neat - Thanks WildWest! Johnny should make an appearance on "The CowBoy Way". There aren't any wholesome CowBoy shows on TV today. And Johnny would fit right in with those Boys. They are respectful family men and they were certainly "raised right". One of them (Cody Harris) sponsors rodeos. Johnny would luv that. you know Deneen....I had that thought pass through my mind (thoughts go thru my mind like water....ha) the other day I was watching the show. the guys were riding hard and roping cows. 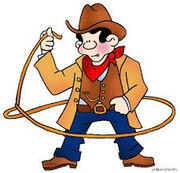 I thought about Johnnys trick roping skills. I wonder if Johnny when he was younger could ride like the wind and rope as well. I know he did calf roping in Jr. Rodeo. I think this is a sweet show or I am just a sucker for Cowboys. I would love to see him on the show. I am disappointed there will not be a big 'to do' about the 60th anniv of the show. Johnny is making one appearance in Calif at the Silver Spur Awards in September and it says 60th of The Rifleman. Tickets start at $175.00 and tickets are limited to 500 people. I am sad there had not been any offerings of items to commemorate the show a fan could purchase online. we even contacted LGL and they planned nothing. When Torchy talked - I guess it only interested those of us who lived in Cleveland. I know all the places and things Torchy talked about but it was Johnny's interview. Johnny was more than gracious to listen to Torchy's stories. Wowww - 121 pounds is quite small for a man. On the few occasions we saw Johnny without a shirt on The Rifleman - Johnny was thin. Not so thin here - Gorgeous! I am sad there had not been any offerings of items to commemorate the show a fan could purchase online. we even contacted LGL and they planned nothing. Are you freakin' kiddin' me?! I guess I'll have to go on E-Bay to find something to commemorate the 60th anniversary for myself. Johnny should really write an autobiography. On the radio interview - Johnny recalled so many things about his life - even from his child-hood. I can hardly remember yesterday. That's a great pic of adult Johnnys chest and thats probably when he weighed more.... but I still prefer the sodbuster. I have tried to get an autograph of Johnny from his FB page which he no longer monitors, someone else does it for him. I even asked and was told.....you have to see him in person to get an autograph. and he rarely travels not far from California anymore. which makes it impossible. I will have to rely on Ebay as well. other living western stars you can order one from their online site. think of the money Johnny could make sitting at home signing pictures and mailing them out. he is nuts not to do it. he has also been asked to write a book but nothing came of it. I hope Johnny doesn't think the "Baby Boomers" have forgotten him. With The Rifleman re-runs - Johnny has a new generation of fans. I Googled the "Silver Spurs Award". Johnny will be presented his award by Steve Connors. It's nice to know Johnny still has a connection to Chuck's family.